Laptop minimalism is a wonderful thing. 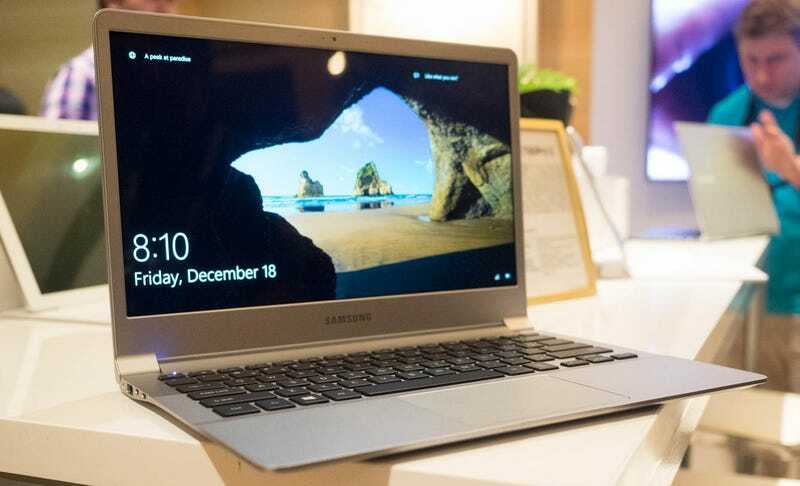 With its new Notebook 9-series laptops, due early this year, Samsung takes reductionist design to a very attractive extreme. Here’s the bottom line: The new 13.3-inch and 15-inch Notebook 9 laptops are full-power Windows 10 machines that weigh just 1.85 pounds and 2.84 pounds respectively. These are not Intel Core M machines—they use the latest Intel Core i7/i5 processors. That’s about as light as they come! Remember, the new Skylake Intel processors have fantastic battery life, which will be important, because it appears that Samsung has cut the weight by skimping a little bit on battery. The 13 and 15-inch models have 30Wh and 39Wh batteries respectively. Consider that the superlight and fantastic Dell XPS 13 has a 56Wh battery—almost twice the size of the comparable Notebook 9. The machines are very light—the 13-inch model is even lighter than Apple’s absurdly small MacBook. But Samsung hasn’t skimped on specs like Apple did. While the Full HD LCD screen isn’t cutting edge, at least the computers pack two regular USB 3 ports, in addition to a USB-C port, which enables fast charging. On top of it all, the laptop has a lovely metallic construction that’s just a pleasure to use. The display has a thin bezel, and though I only typed on the keys for a few seconds, I certainly felt like I could keep typing on them all day without strain. On the whole, the Notebook-9 series looks like a very good example of how to slim down specs in a smart way. That is, of course, if the battery holds up. If not, it’ll at least be an ambitious failure.